Katherine Hunka, Dermot Dunne, and Malachy Robinson. THE VIOLIN, accordion, and double bass will be played by Katherine Hunka, Dermot Dunne and Malachy Robinson, in the Mick Lally Theatre at Druid Lane. 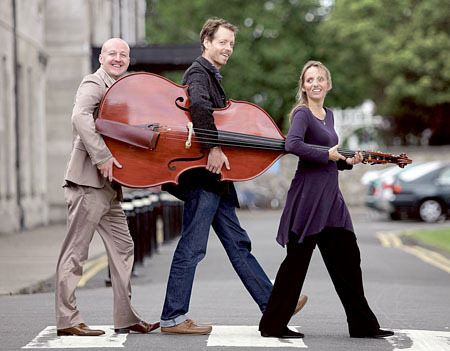 The trio are coming to the Galway venue on Wednesday January 29 at 8pm as part of their Irish tour. The programme will feature baroque, South American, Klezmer music, and film classics. Katherine Hunka is the leader of the Irish Chamber Orchestra and she has performed with Dermot Dunne as a duo since 2007. Malachy Robinson is a member of the ICO and the Crash Ensemble. Places are limited and early booking is advised through www.entertainment.ie, www.classicallinks.ie, and 087 - 280 9932.